Once the lights dim and the music starts blaring inside the Singapore Indoor Stadium, Ben Askren, the reigning ONE Championship welterweight champion, will make his walk down the ramp to the cage for the last time. And before he lays the final brick to his storied professional MMA career, Askren vowed to make his last main event appearance at “ONE: Immortal Pursuit” something to remember. The American fighter is putting his coveted belt and unblemished record on the line against another legend in former lightweight champion Shinya Aoki on November 24. 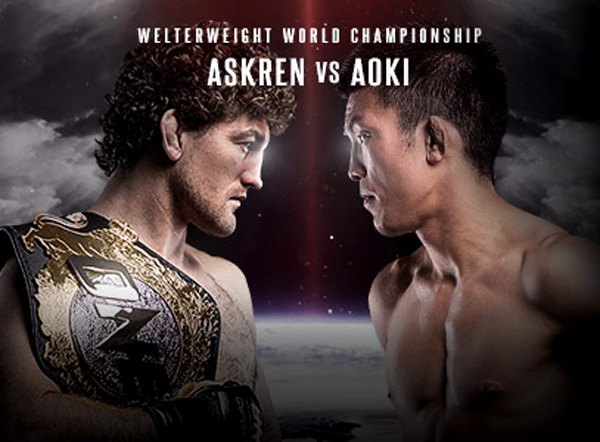 In Aoki, Askren faces a veteran who not only his teammate at Evolve but also a warrior feared for his ground game. The grizzled Japanese might just be the gatecrasher to Askren’s going away party – with his sights set on becoming a rare two-division world champion. Aoki reigned in the lightweight division before Team Lakay’s Eduard Folayang snatched the title away from him on November 11, 2016. The 34-year-old from Tokyo, Japan is looking for redemption this time with the hopes handing Askren his lone defeat. “He is a grappler and has a great skill set that I respect, so I think it will be a great battle,” he added. Still, even with Aoki’s accomplishments and his dynamic grappling pedigree, which vastly contrasts from the American’s, Askren will continue to employ his signature game plan of wrestling his opponent to the ground and using an impeccable top game to finish off his opposition. And come Friday night, the former Olympian will have one last go adding color to his already cemented legacy.